I want that driveway! Thats just beyond gorgeous! :) Anyway it is confusing to me too about celebrating such Holidays at school, Halloween is an American tradition to me. We would have Halloween parades and costume contests in my days and of course i learned plenty too! Another great group of questions! I enjoyed reading your answers. Your apple creations from yesterday's post look yummy even if you made a "gom" of your kitchen. Your Fall color photo is beautiful. I hope you enjoy the falls and that you do indeed take pictures and share them with us here in blog world. Enjoyed your answers! I love your words! Your driveway is to die for! Thanks for hosting this blog, I am not sure how you do it, see I would be repeating questions...lol. I'd have to say your apple pie and cake are probably worth all the mess...they look DE-LISH! I am so envious of all the amazing fall colors you're getting to enjoy...ours here are not quite that vibrant. Be sure to take lots of pics. on your adventure today! I am not a messy cook at all - I put things away as I use them. I hope you share your pictures from the waterfalls. Enjoy! Have fun with the SF&N ladies today! NW Jersey IS beautiful in the autumn (too bad winter comes early and last a long time...) Enjoy your day!! Love the fall picture. Enjoy your day at the waterfall. Love the photo of your driveway. I also liked reading your take on school vs. holidays ---I do realize that having little ones high on anticipation of celebrating can be a difficult task for teachers, but it also teaches the kids patience, social skills, etc. Now I gotta go back and click on the 'cooking' link. I love fall colors. 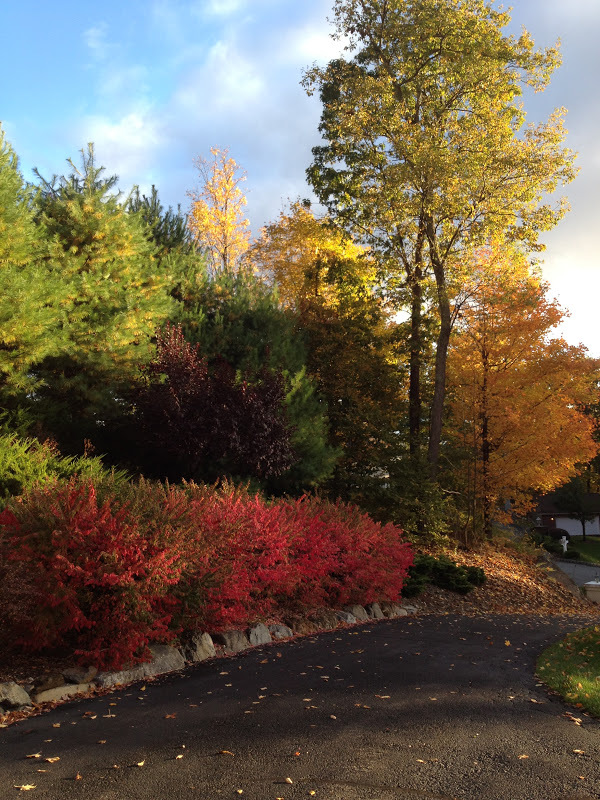 The northeast is full of gorgeous colors, including your driveway. It's s sight to see! I love waterfalls too! Have a wonderful time with your friends. Your fall photo is beautiful! Can't wait to see what you'll photograph today on your outing! I thought of the word ginormous too! I say it frequently. I really enjoyed these questions and see we agree on the whole quiet deal. Enjoy your day, sounds like a lot of "Kodak"moments ahead for sure. See you when I return! Ridonkulous and ginormous are good words. Love that picture of the fall colors by your drive. Beautiful. Hope you have fun at the falls and yes we want to see pictures. Take lots of pictures - I love waterfalls. Thank you for keeping the hodge podge going. I look forward to it all week. I really like your answer to number 2.I never looked at it from a teacher's point of view. Love the picture of your driveway. We use ginormous and ridonkulous as words all the time. I think they should add it to the dictionary. Gorgeous driveway! Waterfalls, fall foliage and friends. Sounds like you have a perfect day ahead. Enjoy! Oh, those colors are ridonkulously righteous:) I will look forward to seeing some more of your autumn colors! Things are just barely starting to turn around here. LOL - ridonkulous is a great word! And wow, what a gorgeous picture. I wish we had fall color down here in Texas. I've always wanted to see something like that. I do enjoy the quiet, however my mind is seldom quiet. I use to say redonkulous all the time after seeing "I Love You Man", Jason Segel said it often. Actually I did a post about how my favorite flower Ranunculus sounds like that! Enjoy your day, can't wait to see pictures. Beautiful picture! The colors are just starting to change here. The earthquake last night seems to have knocked down a lot of leaves along my driveway. I loved your words. I too use ginormous and cannot understand why it is not in the dictionary....it should be. Loved your fall shot too. This was a fun week at Hodge Podge. I'm getting some really good movie recommendations reading the Hp's today. Thanks! YUP the color is all round us and it sure it pretty. Add to that the smell of a fire and this is FALL. Love the word ridonkulous!! Picture is gorgeous NJ fall is really like no other or should I say the East coast fall is like no other! Have a wonderful day! You've got to stop posting your fall pictures else you might get a new neighbor--ME! LOL I do enjoy them. At least someone's getting fall color. We use ridonkulous around here too. Along with a host of other words that escape me at the moment. I could ask the lovelies via text message, but I'm too beat to type the words. :) There are no places in our school that are too quiet. But if we ever do have a place like that, I'm THERE! I agree with your thoughts on halloween, but I feel like the kids rarely have a chance to have fun anymore. We need to let them be kids.It is a mentally a nd physically exhauting day for a teacher, but it is also a day in which we smile and laugh a lot!